A substantial holding in one of the world’s most prospective gold regions. Big Tabar Island, approximately 20 km south of Simberi, and 30 km north of Lihir Island, gives its name to the Tabar Group of islands, including Simberi, Tatau and the very small Mapua, covered by the 260 km2 EL 609. This is a substantial holding in one of the world’s most prospective gold regions. 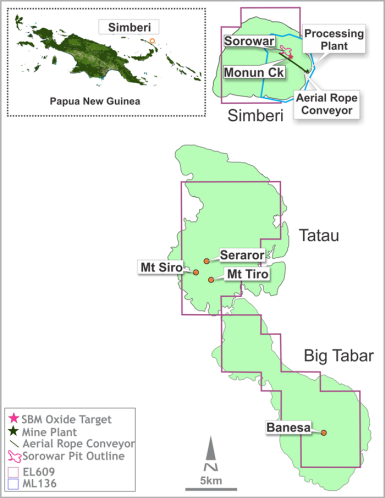 Simberi’s focus is epithermal gold in oxide and sulphide deposits whilst exploration on Tatau and Tabar Islands is targeting both epithermal gold and porphyry copper-gold deposits.